The performing arts, oral expression, festive events, know-how, etc., the intangible cultural heritage reveals itself in very different fields. That’s exactly what brings it its richness and makes it impossible to give any rigid defi-nition of this term. At a time when three dangers: museumification, folklorization and commercialization, are threatening it, will the Unesco Convention for the safeguarding of the intangible cultural heritage succeed in protecting this heritage? 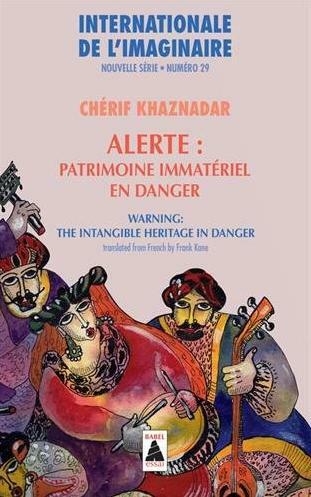 Chérif Khaznadar shares his impressions, his analyses and his warnings, in this bilingual issue, translated from French to English by Frank Kane. The Internationale de l’imaginaire is a forum for meeting and comparison. Like the Maison des Cultures du Monde which it complements, it aims to shed light on people ans institutions involved in creation in various regions of the contemporary world. Since 2008, the journal specifically focuses on intangible cultural heritage topics.